We were honored to be featured last month on Brides.com for the gorgeously understated wedding of Lauren and Alexander. The couple’s wedding day was rustic yet romantic with a clean, neutral color palette that blended in perfectly with their wine country surroundings at Beaulieu Garden. Subtle pops of classic navy blue appeared throughout the invitation suite as well as in the wedding party with their matching navy dresses and blue suits and ties. And to help guide their east coast visitors, we designed a fun envelope liner map to show them the way North. Years back, we designed some promotional pieces for nature and adventurist sports photographer, Jay Goodrich. Jay’s images are spectacularly awe inspiring – so with the simple use of a bright white background and framing, his photographs just pop. See his full portfolio at jaygoodrich.com or follow him Instagram for a daily dose of “Wow”. It’s hard to not swoon over any wedding held at the picturesque Santa Lucia Preserve in Carmel, California. But when you bring together the talented work of event planner Laurie Arons and florist Kathleen Deery, with the the gorgeous photography of Jose Villa, and add in an adorable couple dressed in black tie, it gets even better. We just love the elegant and romantic style of this wedding day and invitation suite. The playful personality of Mia and Kendrick shone through in their invitation design and really packed a punch in the envelope. We loved the bright, bold pink touches, which also added a fun and colorful look to the wedding day as well. 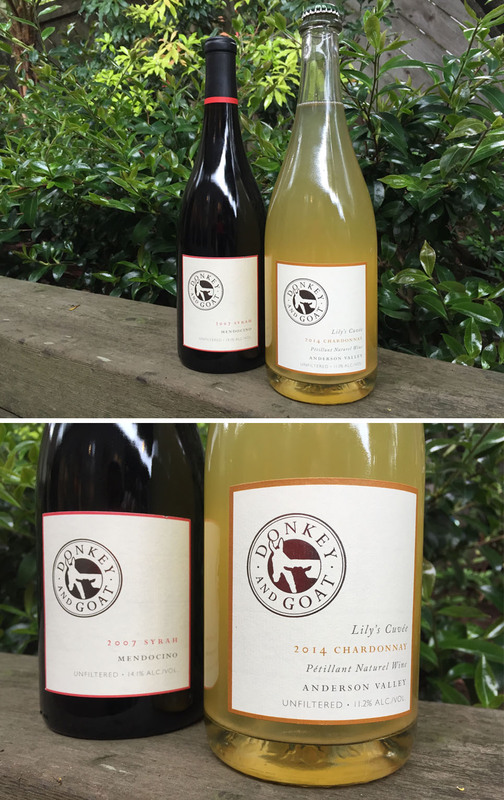 Awhile back we had the fun opportunity to redesign the wine labels for the Anderson Valley winery Donkey and Goat. They recently released a new sparkling Chardonnay (delicious!) and we love that the label looks just as fantastic on a bottle of white as it does on the reds. With just a small color change, the golden color of this delicious sparkling Chardonnay pops off the shelf. Spirited and effervescent! In honor of Cinco de Mayo, we wanted to share these very fun photos from a pre-wedding BBQ fiesta. We teamed together with event planner extraordinaire, Laurie Arons, and helped Sarah and Graham kick off their wedding weekend with a Mexican-themed welcome party. We love the beautiful, unusual combination of navy and rose gold for this Santa Barbara wedding invitation. Navy is such a classic, timeless color, but the blush and copper tones lend a softness to the palette. Jenna Lam Events really brought the entire design to life at Villa Sevillano to create a romantic springtime setting. As seen on Style Me Pretty. Lucinda and Millie are an adorable sheep and chicken duo that live together on a vineyard in Sonoma. They are important contributors to the farm’s ecosystem and we were thrilled to team up with them and the organic winery, Lucinda & Millie, to relabel their bottles of delicious Cabernet Sauvignon and Chardonnay. Take a look at the new designs! It’s Spring Break! Let’s take a look back at some of our favorite beach destination wedding invitation designs to get us excited for some hot sun and sand…. The Cherry Blossom Festival is just around the corner and we’ve been loving the delicate pink buds appearing all over the city. It reminds us of this sweet wedding invitation from a few years back. Now that our new website has gone live, we wanted to share some of the great behind the scenes photos of our studio that we didn’t get to use on the site itself. In addition to shooting all of our work, Carol Vaziri did a fantastic job of capturing our sweet Union Street garden courtyard and design studio where all the magic happens. We were honored to be a part of the 10 year Anniversary issue of Destination I Do. Their Spring issue highlighted Maureen and David’s perfect lakeside wedding. Pics below from the article and of the Lake Tahoe invitation suite design. Having little girls of our own, we felt right at home designing the identity for Allegro Little Shoes. The client wanted the logo to feel childlike and soft, but not overly cutesy. We created a playful silhouette of a child and bird in pale pink. The soft gray serif and script fonts worked perfectly together to create a sweet and whimsical logo that still reflects the inherent elegance of the product. We had such fun designing this playful baby shower invitation. The party was two-fold: an afternoon for the ladies to cook their favorite childhood recipes together and an evening for the boys to celebrate over tacos and margaritas. We just love the warm red and sky blue color combination as well as the adorable illustrations of cooking utensils, baby accessories, and festive happy hour details. We love working with calligraphy in our invitation work. 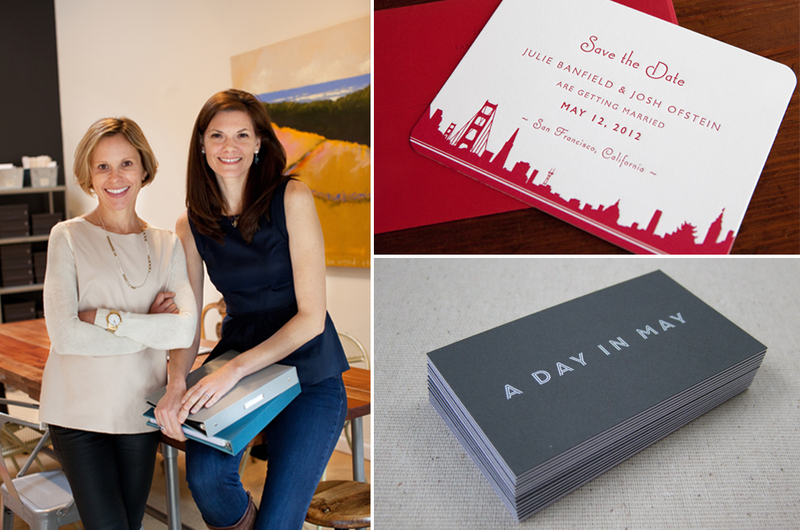 It’s the ultimate way to make an invitation feel very personal and unique. So when Lauren and Doug decided to go this route, we were thrilled. We enlisted Tara Jones to do the hand lettering and together, we created printed pieces that felt sweet but supremely soft and elegant. 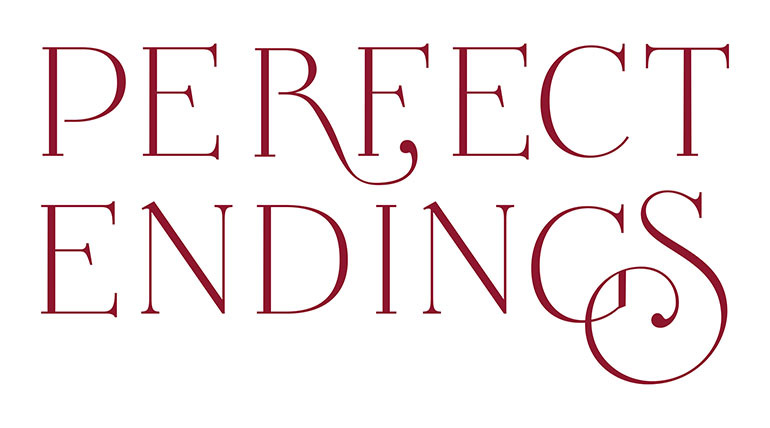 Perfect Endings, a premier wedding and special occasion cake designer based in Northern California, was looking to freshen up their logo. They wanted something accessible and refined, but with a twist – so, we got to work. Whenever we start working on a new logo design we like to explore allllll the possibilities. Below is a glimpse of the different styles and approaches we came up with. We love the final design – seen at the bottom. We’ve often sent out Valentine cards instead of the traditional December holiday mailing. Here’s a favorite from a few years ago. With the help of Barbara Callow calligraphy (barbaracallow.com) we designed pop-out hearts that could be sent to your Valentine – sealed with a kiss, of course. Kristin and John were getting married at a gorgeous historical estate in Long Island called Oheka Castle – not unlike Gatsby’s home – so they knew they wanted to channel the roaring 20’s and go with an art deco aesthetic for their big day. We combined some chic ornamental patterns and a streamlined font with a glamorous palette of black, white and gold. The combination made for an exuberant and luxurious invitation suite. I have a feeling this was a roaring party! Kimmie and Tyler wanted a timeless, elegant wedding invitation for their special day – something that was soft and simple. We created a monogram “logo” encircled within a delicate floral wreath. A neutral gray and white palette kept it from being overly feminine and translated perfectly to the classic décor of their wedding day.